WASHINGTON -- Walking down the steps outside the Supreme Court earlier this month, following a two-hour oral argument over President Barack Obama's health care law, Kathleen Sebelius, the former secretary of health and human services, projected an aura of confidence. As someone critically involved in putting together the Affordable Care Act, she had more insight than most into the debate at hand: whether subsidies authorized under the bill to help purchase insurance were meant to be universal. In that day's argument, the plaintiffs had insisted they were not -- and not just under the letter of the law, but by design. According to the plaintiffs' reasoning, the administration wanted states to establish their own exchanges, so it dangled a major financial incentive in front of them to do so. This, Sebelius said in so many words, was nonsense. "I met up with governors starting on day one and we talked about it," she told a quickly gathering press corps. "I don’t think there ever was a hint that if governors chose not to have their own exchange, that their citizens wouldn't have subsidies." At some point in June, the Supreme Court will issue its ruling in King v. Burwell, a case that could jeopardize health care coverage for an estimated 9.6 million people. The justices' decision may depend in part on how truthful they believe Sebelius' remarks to be. Were the six critical words of the Affordable Care Act -- "an Exchange established by the State" -- meant to be restrictive? Or were they merely oddly worded, and only being goosed up now to muddy the well-understood intent of the law? Over the past year, The Huffington Post has filed public record requests with multiple states and the Department of Health and Human Services to see if there was ever any discussion among federal and state officials about this very topic. HuffPost examined results from within a specific time frame -- after the passage of Obamacare and before August 2011, when the IRS issued its public ruling that subsidies should be universal -- and focused on states that chose not to set up an exchange. In addition, HuffPost looked at more than 50,000 previously released emails from the governor's office in Oklahoma. Among all the emails, letters and press releases reviewed, there was not a single instance of an administration official warning that if states decided not to run their own health care exchanges, their citizens would not be eligible for the tax credit subsidies. Nor was there a single instance of a state official recognizing or anticipating such consequences. As states faced the choice of establishing their own exchange, creating a hybrid exchange with the federal government, or letting the federal government have full control, no one appeared to be discussing what plaintiffs now say is the most consequential financial element of the whole arrangement. Only when the issue began percolating on conservative news outlets, and had life breathed into it from conservative think tanks, did officials start to notice. To be clear, just because HuffPost couldn't find evidence of any discussion on the topic doesn't prove those discussions never took place. Public-record caches aren't always comprehensive, and there are states whose public records we did not examine. Moreover, there is evidence -- slim, but still there -- to suggest that officials did imagine subsidies being used as an incentive. The most famous example is a set of since-disavowed comments from former HHS adviser Jonathan Gruber that came well after the IRS ruling. But if the subsidies were, in fact, structured in a coercive way, then the lack of warning from the federal government makes little sense, and the lack of any debate or apparent distress among state officials is truly remarkable. Here are some examples of the concerns and questions state policymakers had for the federal government as they weighed their options, and the answers Washington provided. On Feb. 7, 2011, then-Gov. 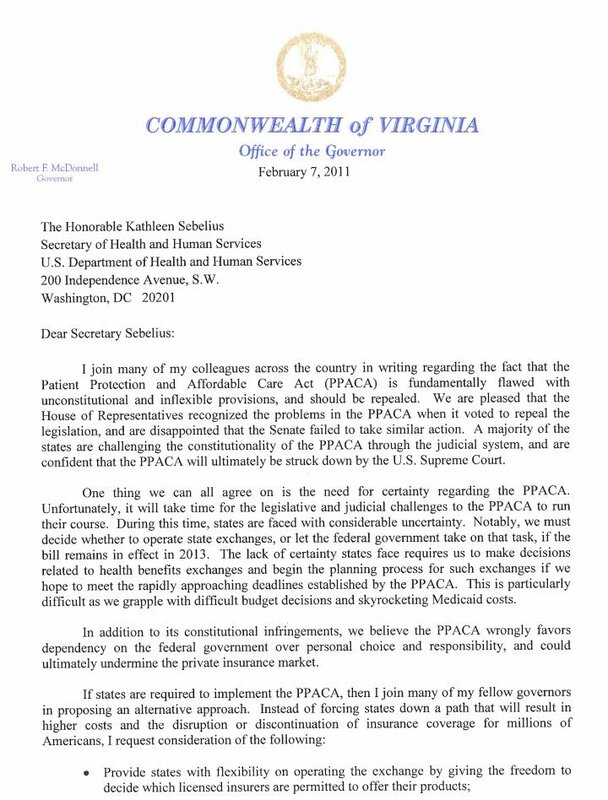 Bob McDonnell (R) wrote to Sebelius that states like his were about to face “considerable uncertainty" over “whether to operate state exchanges, or let the federal government take on that task.” This choice, he said, was “particularly difficult as we grapple with difficult budget decisions and skyrocketing Medicaid costs.” Never mentioned was the possibility that subsidies might not be available if McDonnell passed on creating an exchange. On July 28, 2011, then-Gov. Haley Barbour (R) told Sebelius he was concerned that individuals might not be able to get premium tax credits if they bought insurance through an online broker or agent. He wanted an "allowance" to "ensure a more equitable and fair implementation of the Exchanges" and asked Sebelius to make a favorable interpretation "within your discretion under well-established principles of administrative law." If there was similar uncertainty about the subsidies being unavailable, Barbour didn't express it. 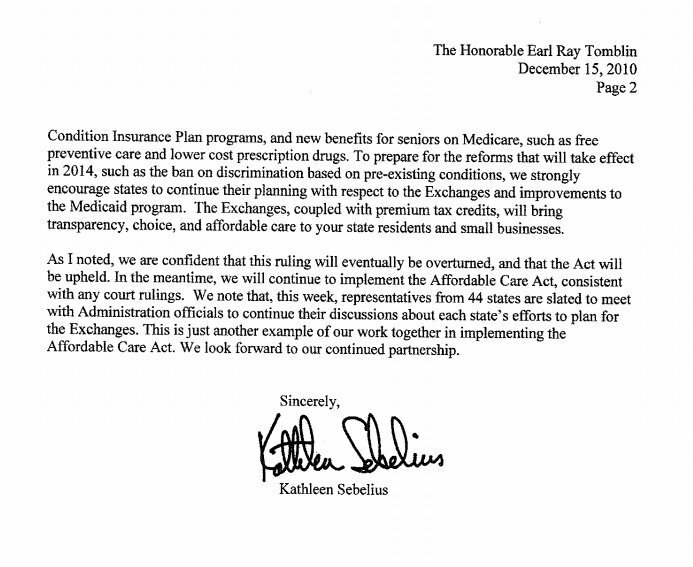 On Dec. 15, 2010, Sebelius wrote to Gov. Earl Ray Tomblin (D), providing him with information about the forthcoming health care reforms. "The Exchanges," she wrote, "coupled with premium tax credits, will bring transparency, choice, and affordable care to your state residents and small businesses.” Never mentioned was the possibility that those premium tax credits would be contingent on Tomblin establishing his own exchange. 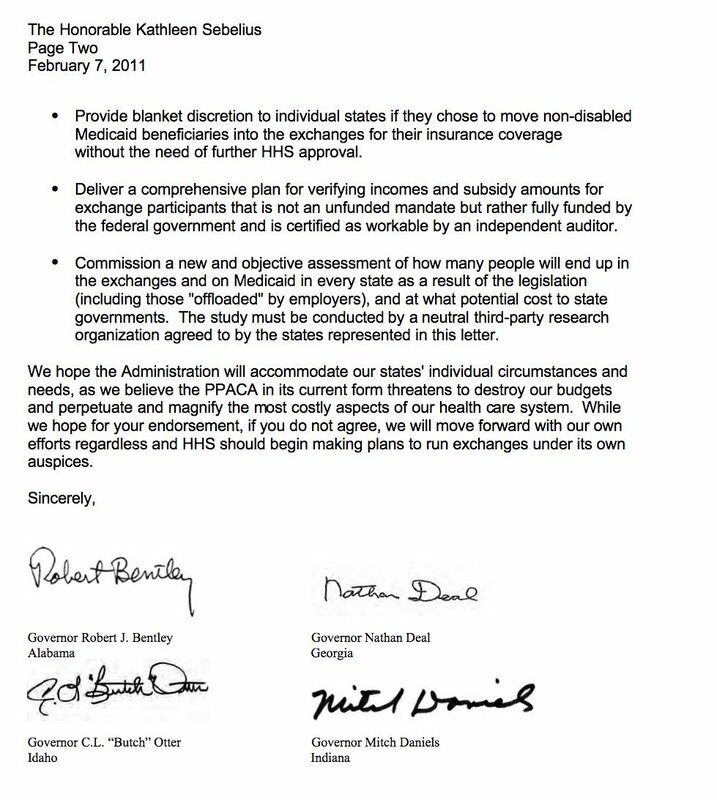 On Feb. 7, 2011, several Republican governors wrote to Sebelius, warning about the possibility of overpayments of subsidies. They suggested that HHS “deliver a comprehensive plan for verifying incomes... certified as workable by an independent auditor." The letter doesn't touch on the possibility that those subsidies would vanish if they didn't establish their own exchange. Indeed, by adopting the premise that the federal government needed to make sure there were no overpayments, the letter indicates that the governors imagined subsidies would be universal. 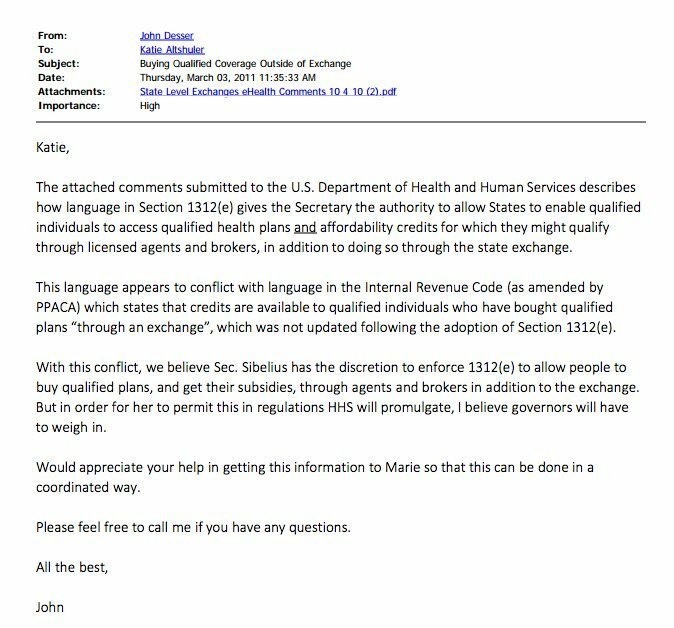 On Feb. 24, 2011, Sebelius sent a letter back, noting that "states have tremendous new opportunities to build on this foundation with the establishment of health insurance exchanges." Nowhere does she say that subsidies would be conditional. On June 16-17, 2011, the firm Leavitt Partners, started by former HHS Secretary Mike Leavitt, presented a memo to the Republican Governors Association's Senior Staff Retreat. In it, they included a slide titled "PPACA Timeline," with critical dates listed. On Jan. 1, 2014 on that timeline is the following: "Premium tax credits available for enrollees under 400% FPL." There is no distinction made for federally run or state-run exchanges. Of all the records on file with regard to Affordable Care Act deliberations, Oklahoma's are the most comprehensive and illustrative. Among the thousands of pages of emails from the days before the IRS ruling was issued, the subsidy issue is utterly absent from the discussions. It just didn't come up, even as the state's governor, Mary Fallin (R), went from strongly advocating a state-based exchange to dropping the issue under intense political pushback. "I cannot recall the issue of the subsidies being tied to a state exchange even being raised," Rep. Mark McCullough (R), one of Fallin's allies in the state House, told HuffPost recently. "I do not remember that being part of the discussion until later, if it was even part of the discussion. That does not stand out in my mind as one of the things we were talking about. The thing we were talking about is the [federal versus state] control issue." The records HuffPost was able to examine bear this out. On April 12, 2010, McCullough attended a seminar at the conservative Heritage Foundation at which multiple people spoke about the exchanges. In his notes from that day, there is no mention of subsidies not being available if the state punted to the feds. 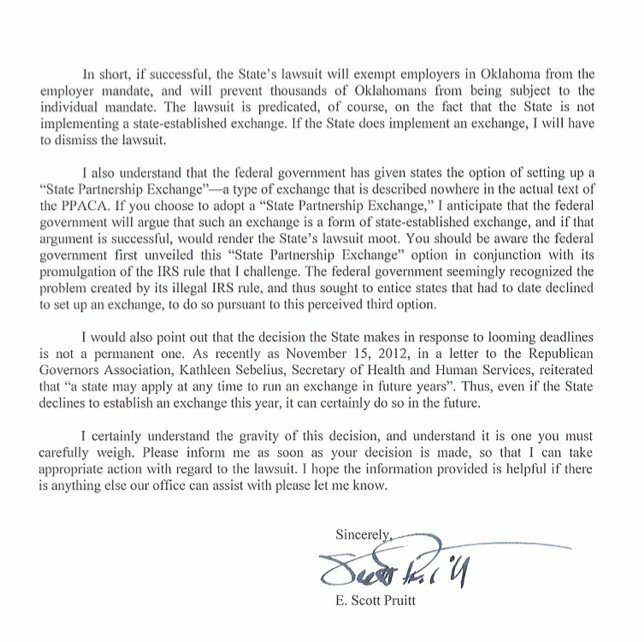 On Jan. 17, 2011, Laura Brookins, executive director of the Oklahoma Association of Health Plans, emailed Fallin’s policy director, Katie Altshuler, about the association’s hopes for a state exchange that the Oklahoma Department of Insurance would regulate. Brookins didn't mention the availability subsidies in that email, even though, theoretically, that would have been a huge selling point. On March 3, 2011, John D. Desser, vice president of public policy and government affairs at eHealth, emailed Altshuler to express his concern about the regulation of subsidies under the law. Desser was concerned not about whether subsidies would be available on a federally run exchange, but whether people would be able to access them if they bought insurance through an online broker or agent. 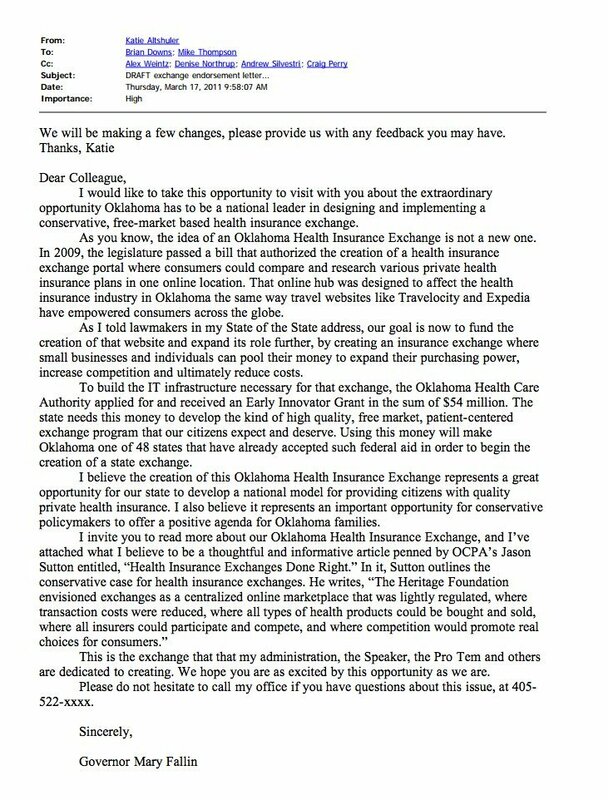 On March 17, 2011, Fallin wrote a Dear Colleague letter encouraging Oklahoma lawmakers to “be a national leader in designing and implementing a conservative free-market based health insurance exchange.” Pitching the idea, she never once mentioned the possibility that the state would lose out on subsidies if it didn’t build its own exchange. On March 22, 2011, Fallin’s aides sent around a draft of a letter pitching a state-run exchange. 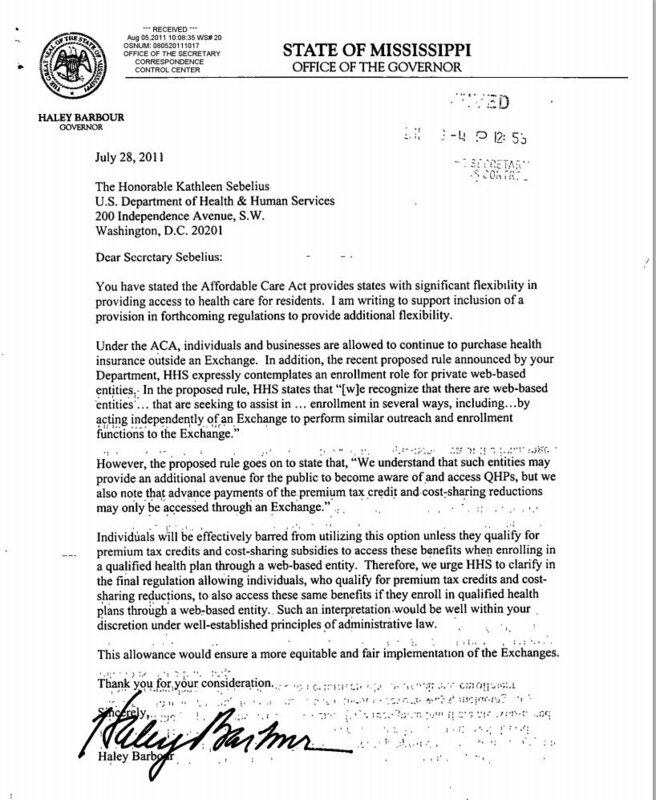 In the letter, an aide noted that an “Oklahoma based health insurance exchange” would “help avoid the forced implementation of a federal exchange run by the Obama administration.” Again, there was no mention of subsidies. 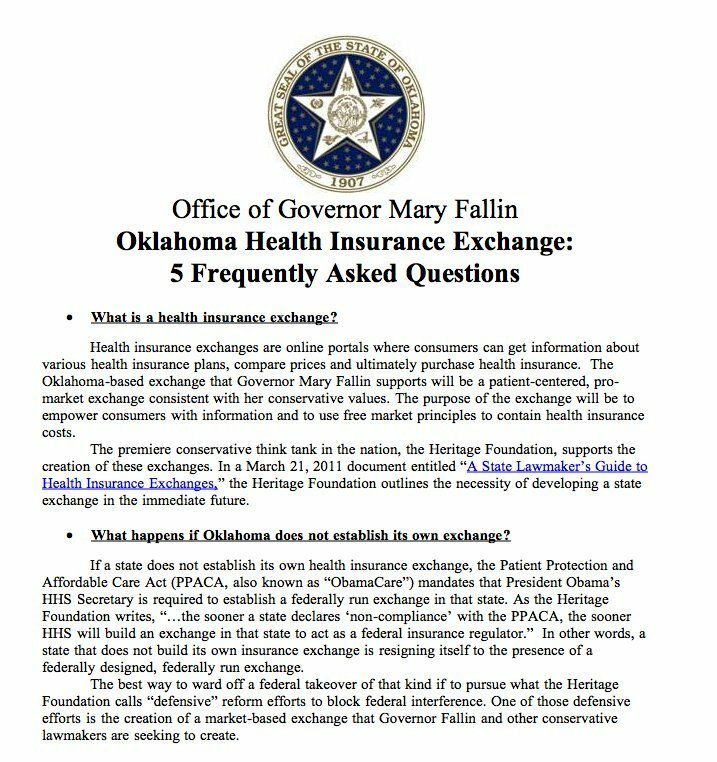 On March 25, 2011, Fallin's office issued a press release on “5 Frequently Asked Questions” about a state exchange. It warns about the consequences of not establishing a state-based exchange, but never mentions the possibility that constituents would lose subsidies. 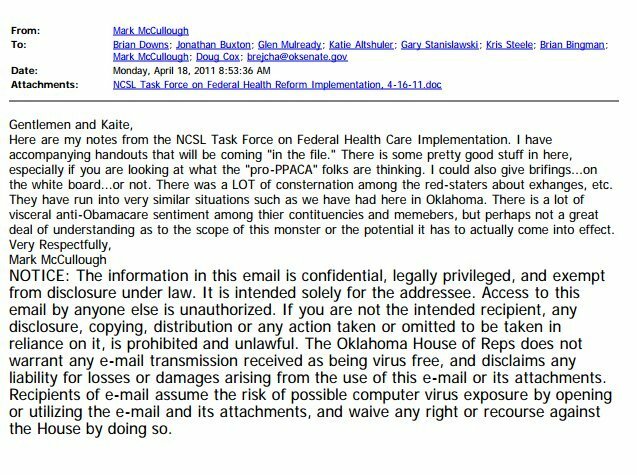 On April 18, 2011, McCullough sent an email to Fallin aides and state lawmakers relaying notes he took at the National Conference of State Legislature's Task Force on Federal Health Care Implementation. There was, he wrote, "a LOT of consternation among the red-staters about exchanges." The issue was "a lot of visceral anti-Obamacare sentiment among their constituencies.” He doesn't mention subsidies potentially being lost. On Aug. 12, 2011, Chris Jacobs, a health policy analyst for the Republican Policy Committee, sent a rundown of the proposed IRS regulations, including those on subsidies, to multiple officials. There is no mention of any major debate over state-run versus federally run exchanges being settled. Looking back on that moment today, Hohlt says she doesn't recall sending the email. Nor is she certain if the issue of the legality of subsidies was raised before then. "Maybe that was it," she said, when asked if she was surprised to discover the issue. "Like, this is the first I've heard of this. What is this? I have no idea." Cannon would, from that point on, become a more prominent fixture in the inboxes of Fallin and her team. Through the summer of 2012, he was emailing regularly with new articles and studies on the illegality of subsidies on federally run exchanges. Fallin's staff would pass around Cannon's emails, sometimes with consternation, as they watched their efforts to build a state exchange unravel. "Ugh," an aide wrote in response to one such email. 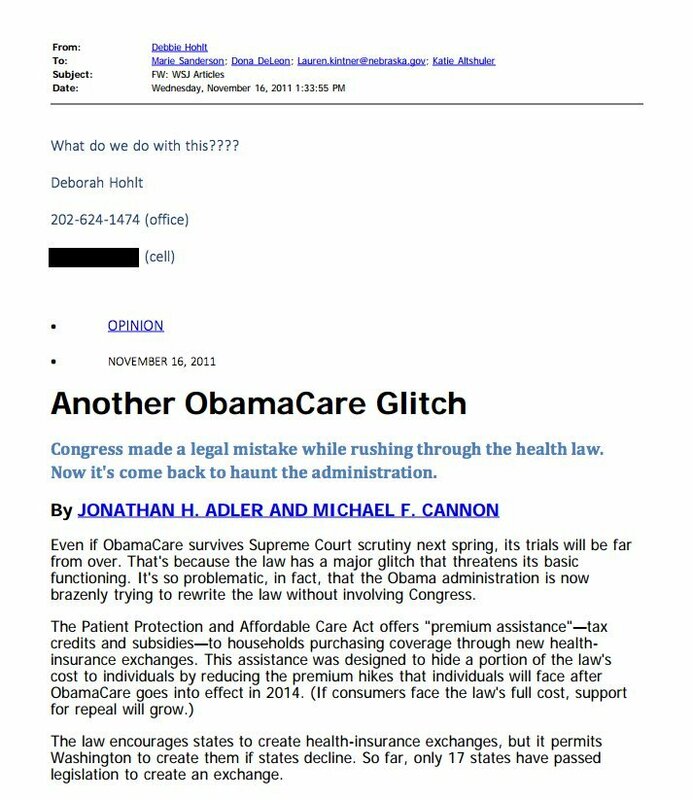 On Nov. 14, 2012, Gary Banz, a representative in the Oklahoma state House, emailed Altshuler to alert her to another Cannon article, this one on the National Review website, titled "Obamacare Is Still Vulnerable." "This is what was discussed on the HHS ALEC conference call yesterday," Banz wrote, referring to the American Legislative Exchange Council, a conservative group that pushes statewide legislative initiatives. By that point, the legal campaign against the subsidies was catching up to the political one. Two days after Banz's email, Oklahoma Attorney General Scott Pruitt wrote to Fallin pleading with her not to set up a state exchange. Pruitt was bringing a lawsuit against the federal government over the matter of subsidies, he said, and if Fallin went ahead it would ruin his case. "The lawsuit is predicated, of course, on the fact that the State is not implementing a state-established exchange," wrote Pruitt. "If the State does implement an exchange, I will have to dismiss the lawsuit." Denise Northrup, Fallin's chief of staff, would describe that letter as "political and purely self serving." Three days later, Fallin announced that she would not set up an exchange. Jason Cherkis, Jesse Rifkin, Maxwell Tani and Jeffrey Young contributed reporting.